CANTON, MA (November 23, 2015) – Today, November 23, is National Espresso Day, and Dunkin’ Donuts is marking the holiday by announcing exciting new ways for people to enjoy the brand’s Espresso, Cappuccino, Latte and Macchiato beverages. Dunkin’ Donuts’ espresso celebration includes a special Twitter sweepstakes today for the chance to win a year’s worth of espresso beverages, followed by next week’s launch of the brand’s first-ever National PM Latte and Macchiato Break beginning November 30 through December 27. Today only, Dunkin’ Donuts is serving up the chance to win a year’s supply of espresso beverages via a National Espresso Day Twitter Sweepstakes. From 9 AM to 5 PM, Dunkin’ Donuts will present followers of @DunkinDonuts on Twitter with four trivia questions to test their Espresso IQ. 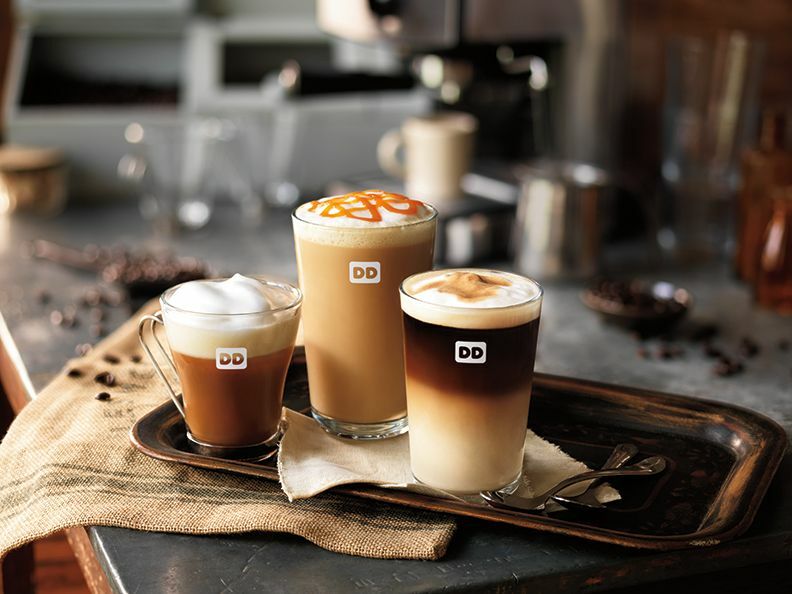 For each question, all who enter using hashtags #DDEspresso and #Sweepstakes will be eligible to win a $100 Dunkin’ Donuts mGift, for a total of four winners. One grand prize winner will receive a year’s worth of Dunkin’ Donuts espresso beverages. For more information about Dunkin’ Donuts’ National Espresso Day Sweepstakes, visit http://dun.kn/1O7QPb6. No purchase necessary, must be 18+ and a legal resident of the U.S. or District of Columbia to enter. Beginning next week on Monday, November 30 and continuing through December, Dunkin’ Donuts is making it easy for people to enjoy an afternoon espresso beverage with the brand’s first-ever National PM Latte and Macchiato Break. From 2 PM to 6 PM each day, participating Dunkin’ Donuts restaurants nationwide will be offering guests a medium hot or iced Latte or Macchiato for the special price of only $1.99. Guests can customize their Latte or Macchiato with any sweetened coffee flavor swirl, including seasonal flavors such as Snickerdoodle Cookie and Peppermint Mocha, which are the perfect complement to any bakery item or sandwich that is served all day long. All Dunkin’ Donuts espresso beverages are made with espresso beans that are 100% Fair Trade Certified™ and selected from the finest, high-quality Arabica beans. Dunkin’ Donuts offers Espresso, Cappuccino and Lattes, and recently introduced Macchiato to its menu. Available hot or iced, Dunkin’ Donuts’ Macchiato is a handcrafted, layered espresso beverage made with steamed milk topped with two shots of Dunkin’ Donuts’ rich, freshly-brewed espresso.